Rick Rosenthal has been playing Santa for 50 years, but it was only seven years ago that the 66-year-old started to turn the role into a year-round career. Now, he's never been happier — or busier. "Once October 1 hits, I basically wake up and work until I fall asleep," Rosenthal tells CNBC Make It. In addition to making his own appearances, he's been the Santa for the Atlanta Braves and Atlanta Falcons sports teams since 2013. He acts as a booking agent for other Santas, Mrs. Clauses and elves around the country. He also founded and runs one of the largest Santa schools in the country. Not bad for a Jewish guy who started off dressing up as Santa in high school to entertain his friends. Rosenthal, who has started several businesses during his lifetime, worked for many years as a mediator and arbitrator in legal cases. Playing Santa was something he only did seasonally. But seven years ago, his parents passed away within weeks of each other. First his mother, after a battle with colon cancer, and then his father, who lost the will to live. As an Orthodox Jew, Rosenthal had planned to follow the religious custom of not cutting his hair, including his beard, for at least 30 days. After his father's death, he decided to wait a full year. Five months later, Rosenthal, an avid gardener, was in Home Depot checking to see if the store had any vegetable plants. While he was perusing the options, he heard a child urgently calling, "Dad! DAD!" When Rosenthal turned around, he says, there was a little boy with a "death grip" on his father's shirt, tugging to get the man's attention, and gaping at Rosenthal. "He's looking at me and he's leaning forward even and he's got this look like a deer in headlights," Rosenthal recalls. Santa Rick with members of the Atlanta Braves baseball team visiting the Scottish Rite Children's Medical Center in July 2018. Rosenthal grasped the problem: With his thick, white beard all grown out, he looked like Santa — only without the famous red suit. So he walked up over to the child and said quietly, "Don't tell anybody that you saw Santa at Home Depot buying tools for the elves." Then, Rosenthal says, he walked away and hid in the back of the store for about 30 minutes so the boy wouldn't see him leave in a vehicle that wasn't a sleigh. "People trust you because you're Santa. They just come running up to you," Rosenthal says. "It is not a job, it's a calling." Many 66-year-olds are retired and enjoying a more leisurely pace. Not Rosenthal. "I literally wake up between 4 a.m. and 6 a.m. every morning," Rosenthal says, so he can get through all his paperwork without being interrupted. Then he's making calls and out on jobs from 8 a.m. to 8 p.m. Afterwards, he goes home and does more paperwork until he falls asleep. "It's not all year round that it's that intense, but that's basically the last three months of the year," he says. For Santa Rick, the Christmas season starts in early October, and sometimes even earlier. There are private Christmas events and gift delivery requests, and Rosenthal works with companies to appear as Santa in special promotions and marketing in the form of TV commercials and print ads. He does photo sessions, too, which often occur before the holidays are in full swing so families can use the photos in Christmas cards. There are about 5,000 to 6,000 professional Santas in the U.S., Rosenthal estimates, a figure corroborated by Stephen Arnold, president of the International Brotherhood of Real Bearded Santas. Currently, the IBRBS has about 2,200 members, some of which include Mrs. Clauses. Rosenthal gets requests to be Santa during the calmer off season, too: For example, he's hired to deliver birthday presents and anniversary presents. "If Santa walks up to you right now and gave you two tickets to Hawaii, you'd feel pretty good about that. You know your husband is just doing some special for you," he says. Rosenthal also makes early Christmas appearances for those who need "a little motivation to stay on the nice list." But this life is not all fun and games. He is called to visit those who are sick in hospitals, and even in hospice. "If Aunt Margaret is going to die and it's March and Christmas was her favorite holiday, we'll do the Christmas in March," Rosenthal says. There are generally two types of Santas: mall Santas and private party and event Santas. Mall gigs can be especially hard work, Rosenthal says. About one in four U.S. adults said last year they planned to get a child's picture with Santa while visiting malls and shopping centers. If you're the lone Santa, you're probably working 70 to 80 hours a week, since most malls are open seven days a week during the holidays, he explains. And even if you're splitting the shifts, that's still a 40-hour week. 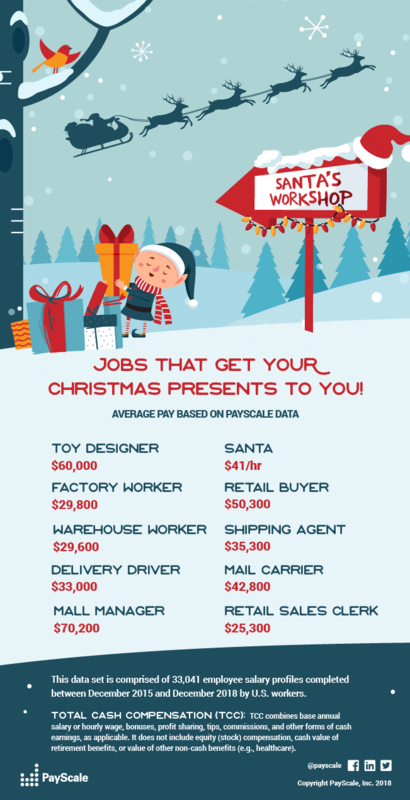 The median hourly wage for Santa is about $41 per hour, according to Payscale. "It's not a job, and it's not work, but it's exhausting and it's grueling," Rosenthal says. "You have to be on your toes mentally and be active physically even though you're sitting down," noting many Santas are lifting children onto their lap for hours. Santa Rick at Hong Kong's IFC mall in November 2018. Most Santas with some experience are making around $5,000 to $8,000 a year, Rosenthal says. Some may make $15,000 or $20,000, but "it's hard to get past that." The Bureau of Labor Statistics reports that the most lucrative Santa jobs are typically those with shopping malls and photography companies. The start-up costs are fairly high, too. A good Santa suit that looks regal and pristine (the most popular Santa look, according to Rosenthal) usually runs between $800 and $1,200. And most Santas need more than one suit since even good little boys and girls can be ... messy. The suit is just the starting point, though. Rosenthal says most Santas also need to purchase boots, as well as a thick leather belt and buckle, which costs between $250 and $400. Customization is key: Rosenthal says many Santas will also purchase magic keys or pouches. Buttons alone can run between $6 and $75 each. "If you don't look like Santa, you're not going to be Santa," Rosenthal says. Arnold concurs: Of course, you can get by on a cheaper suit, he says, but the cost becomes worth it when you hear people say you're the best Santa they've ever seen. "It can be an investment," he says. "But you're rewarded." Then there are the day-to-day expenses, like dry cleaning, which can cost $50 to $150 each time, and the necessary personal grooming, such as beard bleaching to get your facial hair that iconic silvery white, which can set you back about $100 to $200 per season. "For every real-bearded Santa, there are two faux-bearded Santas working as professionals," Arnold says. Rosenthal says trimming nose and ear hair is also a must. He carries a $4 million Santa liability insurance policy and has an independent third-party background check conducted annually. "If you go into playing Santa for the money, don't bother," Rosenthal says. "You're not going to make a lot of money. It's not what Santa's about." Rosenthal does more than just play Santa himself. About two years ago, Rosenthal opened the Northern Lights Santa Academy and the school quickly became one of the largest in the country. Twice a year, he brings together roughly 20 instructors and offers an in-depth curriculum on how to be the best Santa you can. There are between 85 and 115 students per session, a number Rosenthal says he expects to be even higher next year. Santa students pay about $500 for a three-day course. In addition to these sessions, which cover everything from working with special needs children to learning how to craft a business pitch, Northern Lights invites vendors, providing students with the opportunity to purchase the top-notch tools of their trade. "We want to give information you can use and carry forth that will help you be the best you can be at whatever it is you're doing in the Christmas world," Rosenthal says. Over the years, Rosenthal has cultivated a business as a booking agent for other Santas, Mrs. Clauses and elves. The National Santa Agency operates as a full-service entertainment agency, supplying professionally trained and insured Santas, Mrs. Claus, elves and photographers for personal visits, events and marketing needs. The agency has both national and individual accounts, according to Rosenthal. Santa Rick at an Atlanta Falcons pep rally in November 2017. A veteran business owner, Rosenthal says that making Santa into a year-round career is all about having the right attitude. "You have to be an entrepreneur," he says. "If you're not an entrepreneur there's not a chance that you're going to be able to do this all year-round. Even with that, there's still not a very good chance that can do this year-round." Even Rosenthal has help. To keep it all going, Rosenthal's wife and business partner, Tracy, handles all of the administrative tasks like running the billing, maintaining the bookkeeping and drafting contracts, as well as sourcing new clients and creating new marketing. "She's the whole army," Rosenthal says. Next year, they plan to bring on two additional employees. Rosenthal declined to outline what the businesses bring in annually, saying that his model is not what most Santas can expect to earn. "I'm not filthy rich living in the mansion," he says. "I don't own a home." Still, he says, he lives "comfortably." Santa Rick with young boy in a photo session. What keeps Rosenthal coming back year after year is the children. "I've always loved kids. And so, as Santa when you see how children react, it chooses you. The suit chooses you," he says. He calls the experiences he's had as Santa "an amazing thing." A good Santa will, every year, erupt in tears of joy and sadness. "Because people love you and trust you, they tell you things they wouldn't tell their spouses or their children or their parents or their co-workers," Rosenthal says. "They tell you absolutely everything." Those tales can funny but also terribly sad and painful. Children confess that they're worried about their parents getting a divorce, or are homeless, or have suffered abuse. "I have a letter from a child. He's in fifth grade. 'Can you bring me some friends?' he asks," Rosenthal says. If you start out being Santa, you end up a therapist, a policeman, a teacher, a parent. In short, he says, "You have to have a heart to be Santa, that's what it's about."